Are you practicing guitar consistently, but not getting any better? This is a common source of frustration for many guitarists. I know how it is, because I’ve not only been there myself, but I’ve also seen literally THOUSANDS of people struggle in the same way. The good news is, the difference between reaching high levels of guitar playing and failing to do so is quite small. In fact, it’s so small and simple that it will blow you away. By adopting the principles in this article, you will become an awesome guitarist a whole lot faster. Reason #2: Most students do NOT possess the fundamental belief that they WILL become great players (this is CRUCIAL - more on this below). Reason #3: Most students (and most guitar teachers) falsely assume that the primary role of guitar lessons is for students to “learn new things”. This is why students typically ask their teachers: “teach me something new” and become frustrated when something they are shown in a lesson is not 100% new to them. While learning new things is certainly “part” of taking guitar lessons, another key responsibility of your guitar teacher is to help you develop, strengthen and sustain the fundamental belief that you actually WILL reach your goals. Fact is, most teachers are not even sure themselves if they can help you become great, let alone have the confidence needed to help YOU feel the same. The most successful guitar students I’ve taught all shared the belief that they would become great players as a result of studying with me. These musicians got the biggest results even if they had no idea when, or how this would happen when they started. They believed with certainty that their greatness would be inevitable even before they experienced any direct or personal proof of this from being my student. They simply believed that they and I, together, would achieve their goals. They had faith in the process, the journey and the final destination. These guitar students are not any more experienced, talented or special than the average person - they simply think differently. This is why I work very hard to get ALL my students to think in this way - because it is the single greatest predictor of their success in our lessons together. 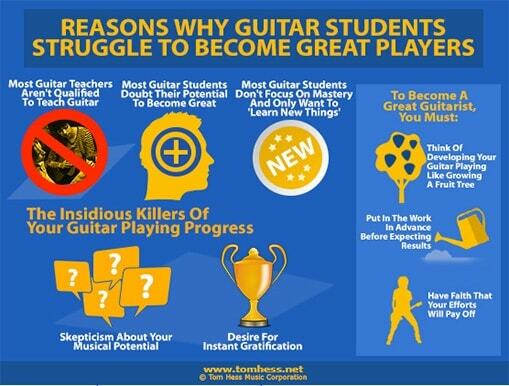 This is also the #1 reason why I consistently produce superior results with all my guitar students and it is the #1 reason why guitar players who naturally possess this belief within themselves consistently become great players. I'm sharing these concepts with you now, because I want YOU to be successful. When I see that a new student possesses this mindset, everything becomes easy. These students are easy to teach, because not only are they hungry for knowledge, but they are also sure to ACTUALLY DO what needs to be done to become great. Because of this success mindset, their chances of becoming an incredible guitar player from studying with me are virtually 100%. Think about huge results (in your guitar playing) as fruit on a tree. In order for the fruit to be abundant and taste great, the roots (everything below the surface) need to strengthen and grow first. When you plant a tree into the ground, you do so with the expectation and BELIEF that the fruit WILL taste great and be abundant BEFORE you get to taste (or even see!) it. You simply know and believe that if you do the right things necessary to make the tree grow, you will receive your fruit in due time. Your expectation of the result only stems from knowledge that there have been many OTHER trees planted before the one you are planting and they all produced delicious and abundant fruit. In other words, you don’t need to taste the fruit yourself (yet) to believe that it will appear if you take action to make your fruit tree grow. On the other hand, if you expect to taste the fruit from your tree before you commit to planting it, nourishing it and giving it enough time to grow, you would obviously never taste the fruit at all. Your guitar playing develops in much the same way. Before you become the guitarist you want to be, you need to have faith that the process you are going through to get there WILL deliver results (if you do YOUR part). This is one of the reasons why, when you look for a guitar teacher, you MUST first look for proof of that teacher having produced lots and lots of really great students. Without this proof, it will be very hard to trust the process and have faith in your potential. They are too skeptical, impatient and afraid to have faith in themselves and in the process of reaching their goals. This sometimes happens even with new guitar students of mine to whom I show the overwhelming PROOF of massive results I’ve achieved with other guitar players. So part of my responsibility as a guitar teacher consists of changing the mindset of my students and getting them to believe and have faith in their potential to become GREAT musicians by studying with me. After this faith is established, taking guitar students through the process and actually delivering results to them becomes the easiest part of my job. Most guitar students don’t recognize the progress they’ve made because they may not see the results beneath the surface until months or even years in the future. This means that their mindset is directly influenced by whatever tangible results they can immediately see. As soon as tangible improvement is not obvious, their faith in themselves, me, and the process plummets. However, as explained above, many steps in the process of your musical growth are NOT tangible. If you only focus on the immediately tangible results, you are drastically stunting your growth and are getting in the way of you becoming the guitarist you want to be. Some people will read this and think that all this talk about mindset, belief systems and faith is all a bunch of abstract nonsense or theory. And that's fine, they can believe whatever they want. However, the fact remains: after teaching tens of thousands of guitar lessons over the last 25+ years and producing hundreds of really excellent guitarists, I can tell you with complete and total certainty that what I'm saying is a proven fact, not a mere theory. By implementing a better mindset and studying with a proven guitar teacher, you too can become a truly awesome guitarist. To learn more about speeding up your musical progress, check out this free mini course on how to reach your musical goals. Achieve all of your music goals and become the guitar player you’ve always wished you could be through online guitar lessons.